When you purchase software from Wide Angle Software, you'll receive an activation code for your licence. You'll use this activation code when you open your purchased software to unlock the full, unrestricted version of the program. 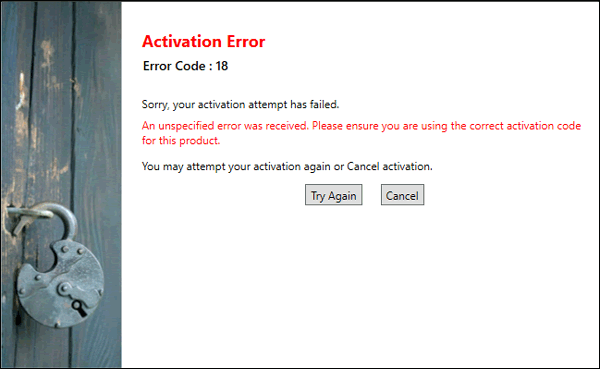 However, if you enter your activation code and create a password, but the software returns a window that states "Activation Error - Error Code 18", the activation will not complete successfully. Error code 18 can occur when a program does not have the correct permissions to write a required file (in this case, the activation details). To resolve this, please try running the program as an administrator. To resolve error code 18, follow the steps below. In this example, I'll be activating the software "TouchCopy", but the same steps apply for overcoming error code 18 with any Wide Angle Software on Windows computers. Close the program you were trying to activate. Then, right-click on the program icon either on your desktop or in your programs folder. Click 'Properties' and then go to the 'Compatibility' tab. Relaunch the program and attempt to activate again. Our support team will sometimes advise running your software as administrator for other reasons too. For example, if your computer requires a piece of software to have additional permissions to access backups, or transfer files from a device to a location on your computer. 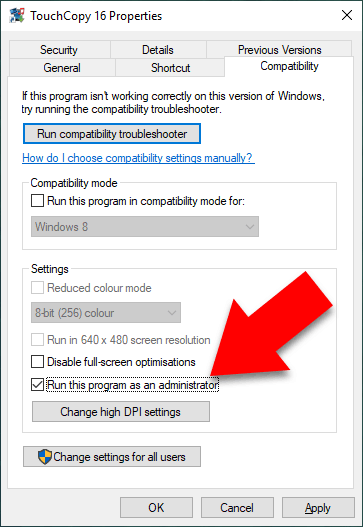 If you've followed along with this guide, you'll already be running as administrator, so you won't have to do these troubleshooting steps again.